Synopsis: In Deliver Us From Evil, New York police officer Ralph Sarchie (Eric Bana), struggling with his own personal issues, begins investigating a series of disturbing and inexplicable crimes. He joins forces with an unconventional priest (Edgar Ramirez), schooled in the rituals of exorcism, to combat the frightening and demonic possessions that are terrorizing their city. Inspired by the book, which details Sarchie’s bone-chilling real-life cases. Audiences love true stories, whether they come in the form of Oscar bait films like Dallas Buyers Club or more exploitative movies like The Conjuring. All a script needs is a kernel of truth to be able to make the “based on actual events” claim, no matter how unbelievable the story may be. Some of these movies stretch the realm of credibility. Deliver Us from Evil is one of these movies. Deliver Us from Evil begins with NYPD Police Officer Ralph Sarchie (Closed Circuit‘s Eric Bana) and his partner, Officer Butler (Joel McHale from “Community”), having a typically tough week consisting of a domestic violence call and an incident involving an insane woman throwing her baby into the lion’s den at the New York Zoo. After a bit of investigation, Ralph discovers that the two cases are related; the husbands in both cases served in the same platoon during the Iraq war with a mysterious man named Santino (Sean Harris from Prometheus) who keeps popping up in both men’s lives and causing trouble. Ralph and Butler are not the only ones intrigued by the cases; a priest named Father Mendoza (Edgar Ramirez from Wrath of the Titans) has also been following the incidents closely. Mendoza tells Ralph that he believes that the soldiers brought something supernatural back with them from Iraq, and he thinks that the incidents may be caused by demonic possession, with Santino at the root of the infestation. To make matters worse, Santino is still on the loose, and now seems to be targeting Ralph’s wife and daughter. Demonic possession or not, Ralph enlists the help of Father Mendoza in an effort to solve the cases and save his family. The screenplay for Deliver Us from Evil was inspired by a book written by the real Ralph Sarchie called “Beware The Night.” Like his character in the film, Sarchie was an NYPD officer who, after repeatedly being exposed to incidents which seemed to be caused by otherworldly forces, began to study the paranormal and eventually became a demonologist. Writer/director Scott Derrickson (Sinister, The Exorcism of Emily Rose) and writing partner Paul Harris Boardman (who worked with Derrickson on The Exorcism of Emily Rose) turned the cases that are documented in the book into one coherent story, crafting them into a well-paced crime thriller that lies somewhere between a long episode of “The X Files” and David Fincher’s Se7en. It’s hard to say how many of the far-fetched events depicted in Deliver Us from Evil are based in fact – only Ralph Sarchie knows for sure. Nevertheless, whether it’s a true crime film or a complete fabrication, Deliver Us from Evil is still an effective movie. Although it’s being promoted as a horror movie, Deliver Us from Evil is actually a police procedural film along the lines of Silence of the Lambs, only with a demon playing the part of Buffalo Bill. In comparison to Derrickson’s other films, Deliver Us from Evil lacks the visceral impact and overt scares of Sinister, but is much more action-oriented than The Exorcism of Emily Rose. It falls somewhere between the two, but doesn’t simply take the best parts of each; it just straddles the line between horror and mystery instead of blurring it. It’s tense, dreadful, and just smart enough to keep the viewer engaged without forcing them to cover their eyes in fear. The biggest issue with Deliver Us from Evil is in the ending. It’s not really a spoiler to say that the climax of the film involves an exorcism. Unfortunately, it’s the same exorcism scene that audiences have seen time and time again throughout cinematic history, especially in the post-The Exorcist era. With such a creepy buildup, the highly typical exorcism sequence feels like a cop-out, almost as if Derrickson couldn’t find another way to end his film. 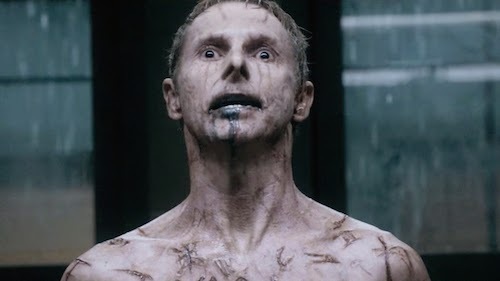 It doesn’t exactly ruin the experience, but the potential for Deliver Us from Evil to be an instant classic was there, if only a more inventive route could have been taken for the conclusion. Considering the outlandish subject matter, the cast members in Deliver Us from Evil turn in some stellar performances, not too serious yet hardly tongue-in-cheek, either. Eric Bana and Edgar Ramirez are the obvious leads, and they have a fun odd-couple chemistry between them, with a give-and-take dynamic that works well within the context of the film. The devilish Santino is a remarkable villain, and Sean Harris’ effortless way of playing him is awesome. The supporting cast includes Olivia Horton (The Dream Team), Chris Coy (Hostel: Part III), and Olivia Munn (Magic Mike), and they all deliver the same type of somber spookiness that helps to sell the film. The real scene-stealer in the film, however, is Joel McHale. Audiences are used to seeing McHale’s comedic side on “Community” and “The Soup,” but his turn as Ralph’s partner, Butler, in Deliver Us from Evil proves that he can handle drama as well as anyone. Of course, the character has his share of witty one-liners that function solely as comic relief, but McHale’s performance goes beyond that; the actor switches from humorous foil to action hero in the blink of an eye, and McHale makes the most of his comparatively modest screen time. Joel McHale is the unsung hero of Deliver Us from Evil. While Deliver Us from Evil is a very dark and brooding movie, it’s not particularly scary. It’s more of a crime drama that happens to involve demons and devils than a full-on horror movie. It has its moments that are chilling, and a handful of jump scares that are effective in their own way, but for the most part it’s just a taught, suspenseful movie. There’s plenty of spooky imagery – Ralph’s daughter’s mysteriously moving toys, the laughing children mixed with static that only Ralph can hear, the seemingly omnipresent music of The Doors – that could raise some goosebumps in the right environment, but as far as actual scares go, Deliver Us from Evil is pretty light.